In early 1999 I was Managing Director at a not-for-profit professional theatre in Jackson, Mississippi’s historic Belhaven neighborhood. One morning, as I was working at my desk, an intense young man walked in to see me. He introduced himself as Patrick and announced that there were Eames-style mid-20th century chairs in the side alley outside a backstage exit of the theatre and that he wanted them. I knew the chairs he was referring to. They were molded plastic chairs in the style of American design icons Charles and Ray Eames. Actors and crew used them to gather and smoke backstage during rehearsal and work breaks and performances. “They’re out there in the elements getting weathered and ruined,” the guy said, “and all they’re being used for is smoke breaks.” He had clearly pre-planned his appeal. He said he would bring metal folding chairs to replace the ones he would like to trade. He explained that he collected mid-century modern chairs and would make sure the alley chairs didn’t get ruined further. He made sense. Any old chair would serve the purpose that the plastic chairs were serving and here was somebody who would treasure chairs that we were allowing to rust and fade in the alley. Also, that Eames style has been copied and replicated so many times that the fading chairs would have minimal monetary value in their dilapidated condition. I told Patrick I would need to discuss the matter with the props and scenery staff and that I would give him an answer by the next morning. Later that day, I made the case for the swap to the properties master and technical director and they agreed to the trade. I gave Patrick a call. He arrived soon after to trade weathered cheap metal chairs for weathered cheap plastic ones. On the other hand, I really didn’t know Patrick and knew nothing at all about what kind of art he created. “What would you need from me?” I asked. I thought about it and said “Sure, okay.” I wasn’t sure I had made a wise decision and decided not to mention the upcoming sitting with anybody until I saw how it all turned out. On Monday night Patrick arrived at my door with his canvas and supplies. He set up quickly and I asked him what he wanted me to do. So he began to paint and we chatted. Patrick was very forthcoming and spoke frankly about a lot of things including his travels, his bipolar disorder, and his history with addiction. After about ninety minutes he stopped and announced that he was done. I thanked him for the painting as he packed and went out into the night. After he left I sat across the room and stared at the painting. That was pretty weird I thought. A few days later, after I had gotten more comfortable with the new painting, I asked a couple of people who worked in the theatre if they knew of a local artist named Patrick Grogan. They perked up. They did know his work and I got the idea that he was pretty well-respected by the artistically connected people I was talking with. “He’s kind of a local character but he’s good. I like his work. It’s really different,” said one person who was also a painter. They wanted to know why I was asking and I finally admitted that Patrick had recently painted my portrait. This information was met with general excitement and enthusiasm. “How much did he charge?” I was asked. “Actually, he just sort of gave it to me,” I answered sheepishly. That caused everybody to buzz and everybody was anxious to come by my place to check out the portrait. I was just relieved that this stranger I had allowed into my house was a known quantity. Now that I knew that Patrick was known around Jackson, I began to seek out his work and found that most of his art focuses on animals and Native American themes and imagery. It has a distinctly American West vibe … well, American West on peyote. Friends began to come by to see my portrait and they all were impressed and couldn’t believe that the artist just gave it to me. Soon after, some Patrick Grogan paintings were being displayed in a local designers’ showcase house to benefit some Jackson organization. A couple of colleagues asked if I would arrange a lunch at the show house with Patrick so that they could meet him and see the work on display. I contacted Patrick and asked if he’d be interested. He said he was always interested in a free meal and we set a luncheon time. On the scheduled date, I bowed out due to some work-related matters and sent my colleagues along to meet Patrick. Since I wasn’t there, what I know about the lunch is second-hand. 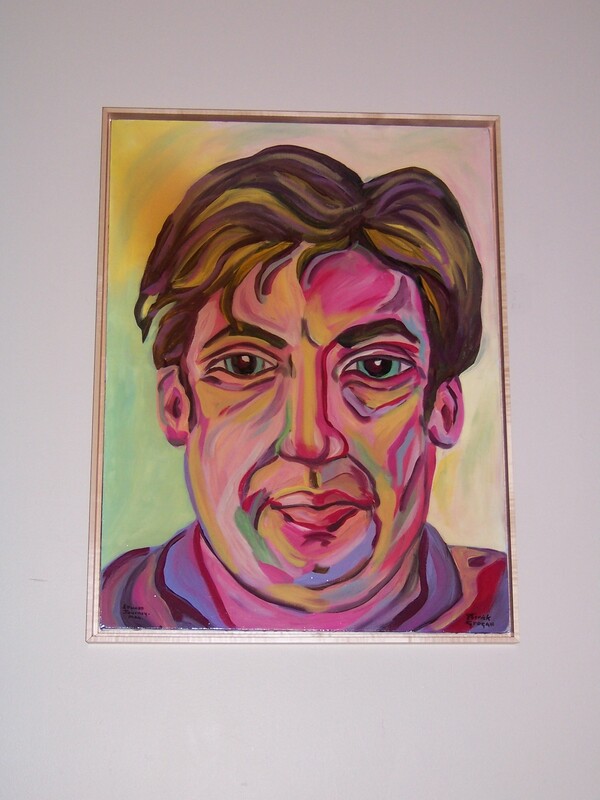 I heard that one of my colleagues, after telling Patrick how much she liked his painting of me, proposed to Patrick that she would like to commission him to paint a portrait of her sons. “Of course I’d pay you,” she said, pressing on. Patrick apparently said something along the lines of “Doesn’t matter. I wanted to paint Edward; I don’t want to paint your kids.” The luncheon quickly came to an end. Soon after these events, I took another job and left Jackson. Patrick was hard to keep up with but I heard from him infrequently and heard reports about him over the years. When I met Patrick in Jackson, he was living down the street from the theatre in a 4-plex on Fortification Street. A couple of years later, that building – to the delight of some and the dismay of others – became a large canvas for Patrick to paint on and he covered the facade of the two-story building with trippy and vividly colorful images of many things including religious images, Native Americans, wild animals, totems, birds, and a dachshund to the right of the front door. Like or loathe it, the 4-plex became a Jackson landmark and provoked a lot of discussion. I’ve heard about various Patrick Grogan exhibits here and there over the years and he apparently has a mural in the food court of a Jackson mall. His work is hard to label but one writer in Jackson referred to him as an “eccentric artist” and I think that works as well as anything. A profile in the Jackson Free Press was simply titled “King Freak.” That works too. www.jacksonfreepress.com/news/2011/jan/05/king-freak. A few years ago I ran across a terrific little book for young people called Birding for Children www.birdingforkids.com. The book has a text by Art Minton and is beautifully illustrated by Patrick. Browsing through that charming book and looking at Grogan’s body of work it is easy to understand his identification with Walter Anderson, another “eccentric” Mississippi artist. Patrick’s anthropomorphic animals also remind me of the work of Alabama sculptor Frank Fleming. I have heard and read several conflicting versions of an incident in 2009 when Patrick attended a service at a traditionally white Jackson church wearing blackface makeup and a hoodie to make a point about exclusion in the church (or something). In Patrick’s version, ushers escorted him out of the building during a prayer and roughed him up. In the version of others, Patrick came and went without incident but made a lot of people a tad uncomfortable. In all fairness to that uncomfortable congregation, I suspect that if Patrick had entered any church service in Jackson — white or black or mixed or whatever — in blackface makeup and a hoodie, the same responses would very likely have occurred. Patrick has traveled a lot and could probably go to some place like New Orleans or San Francisco, Key West or Austin, and easily blend in with a larger community of “fringe” characters but I like that he chooses to stay around Jackson and be a provocateur. It’s his home, after all, and he has as much right to be there as anybody. Back in 1999, after the sitting was over and Patrick had given the painting to me, he turned the canvas around for me to see for the first time. “What do you think?” he asked. And he was right. I love the painting and it has had pride of place in every place I’ve lived ever since. And I look so young. This entry was posted in Patrick Grogan and tagged Art Minton, Belhaven neighborhood, Birding for Children, Charles and Ray Eames, Eames chairs, Fortification Street painted house, Frank Fleming sculptor, Jackson Mississippi, Mississippi artist Patrick Grogan, Native American-themed art, Walter Anderson on June 18, 2015 by gedwardjourney. Thank you so much. And I appreciate your support. I’ll try to keep it interesting.